This collection of selected resources offers high-quality information about primary care and oral health. Use the tools below for further searching, or contact us for personalized assistance. Share these facts to help improve the oral health of pregnant women, children, and adolescents and their families. Braun PA, Cusick A. 2016. Collaboration between medical providers and dental hygienists in pediatric health care. Journal of Evidence-Based Dental Practice Suppl:59–67. Arthur T, Rozier RG. 2016. 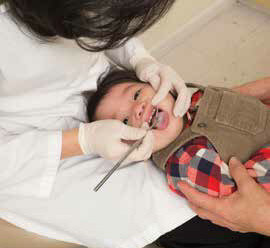 Provision of preventive dental services in children enrolled in Medicaid by nondental providers. Pediatrics 137(2):e20153436. Hallas D, Fernandez JB, Herman NG, Moursi A. 2015. Identification of pediatric oral health core competencies through interprofessional education and practice. Nursing Research and Practice Epub 360523. American Academy of Pediatric Dentistry, Council on Clinical Affairs. 2011. Guideline on perinatal oral health care. Fulmer T, Cabrera P. 2012. The primary care visit: What else could be happening? Nursing Research and Practice Epub 720506. Stearns SC, Rozier RG, Kranz AM, Pahel BT, Quinonez RB. 2012. Cost-effectiveness of preventive oral health care in medical offices for young Medicaid enrollees. Archives of Pediatrics and Adolescent Medicine 166(10):945–951. Malecki K, Wisk LE, Walsh M, McWilliams C, Eggers S, Olson M. 2015. Oral health equity and unmet dental care needs in a population-based sample: Findings from the Survey of the Health of Wisconsin. American Journal of Public Health 105(Suppl 3):S466–474. Keels MA. 2014. Management of dental trauma in a primary care setting. Pediatrics 133(2):e466–476. Close K, Rozier RG, Zeldin LP, Gilbert AR. 2010. Barriers to the adoption and implementation of preventive dental services in primary medical care. Pediatrics 125(3):509–517. Blue C, Riggs, S. 2016. Oral health care delivery within the accountable care organization. Journal of Evidence-Based Dental Practice Suppl:52–58. This report describes a national initiative to provide guidance to oral health programs, primary care associations, and community health centers in identifying and planning collaborative state-level oral-health-improvement projects. Contents include information about the state application process; coaches who provide guidance to the project; resource materials; the launch webcast; team work plans in Colorado, Hawaii, Illinois, Kentucky, Ohio, and Oklahoma; responses to a follow-up survey; and recommendations. This report provides information about an investigation into and analysis of conditions and contexts, attitudes, beliefs, resources, and policies associated with integrating oral health care into care provided at federally qualified health centers. The report presents the rationale for promoting oral health at well-child visits, implementation science (a tool to identify best practices) and study methods, results, and discussion. This report presents case studies of eight federally qualified health centers (FQHCs) across the United States. It describes findings from a project conducted to understand the barriers and facilitators to integration of oral health services into primary care in FQHCs as well as to understand FQHCs’ use of different types of oral health professionals to provide access to oral health services within their delivery systems. The report also identifies useful technologies that enable service integration in FQHCs. This monograph presents information on five health centers that have successfully integrated oral health into primary care. Contents include background on oral health disparities and health center leadership in providing access to oral health care; a framework for exploring integration; an overview of the participants, methods, and results; and profiles of the health centers in Colorado, Kansas, Kentucky, Massachusetts, and Washington. This brief presents findings from a study to assess oral health care capacity in community health centers (CHCs) in California. Topics include the geographic distribution of CHCs with co-located oral health care and primary care; size, productivity, and revenues of co-located sites compared to those without on-site oral health care capacity; and opportunities to improve access to oral health care in CHCs.